Invisalign is a new way to straighten teeth without braces by using a series of clear removable aligners. 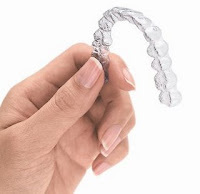 When worn, the aligners are virtually invisible… – one patient reported that she wore Invisalign aligners for several days without anyone in her family or workplace noticing until she called it to their attention! Invisalign was launched in Singapore in 2005 (it was launched in 2002 in Hong Kong and Australia). Specialist Dental Group has several Invisalign-accredited dentists on our team, including Dr Eugene Chan. Gone are the days of the “metal mouth”…. with Invisalign, you can go about your daily activities with minimal disruption to your schedule. You can also eat anything you like as the aligners are removed for meals, and put on again after you have brushed your teeth….this also leads to better oral hygiene. Invisalign uses clear aligners to move teeth. The aligners are changed every two weeks, allowing gradual movement of teeth and minimizing discomfort. These aligners are customized for every patient. Patients are generally given three sets of aligners and they only see the dentist every 6 weeks to check on the progress of their case. Thus, there is reduced frequency of appointments needed compared with braces which requires appointments on a monthly basis. 1) Teeth are straightened invisibly – as mentioned above, few people can tell that you are wearing Invisalign….it is analogous to wearing contact lenses. Patients using Invisalign smile more during treatment and it does not affect their social life. 2) Invisalign aligners are removable – you can eat or drink anything and can easily brush/floss your teeth resulting in beetter oral hygiene. Studies have shown that Invisalign wearers have better oral hygiene and less gum problems compared with braces patients. 3) Comfortable – since there are no brackets, there are fewer abrasions to the mouth during treatment. The teeth also feel less sore since less force is used as the aligners are changed every two weeks, compared with the monthly adjustment for braces. Your dentist will examine your dental condition and discuss with you the various options to straighten your teeth, including the advantages and disadvantages of each method. If you decide to proceed with Invisalign, an impression of your teeth will be taken as well as a photograph (front and profile) of your current dental condition. Your dental impression will be sent to a CT scanning machine and incorporated into the ClinCheck 3D animation software. This is a web-based computer program which will show the movement of your teeth from start to finish. Your dentist will discuss the ClinCheck case with you and make any necessary adjustments to your treatment plan. Once approved, all the clear customized aligners required for Invisalign treatment will be fabricated. For more information on Invisalign, please click here.